Dangerous & Dramatic Doc - You don't know me. And that is freaky beyond all get out. LOL, It IS scary. I hope I didn't freak anyone out too much. "Joan River's plastic surgeon used his own features as inspiration." LOL. I adore that. That absolutely rocks. 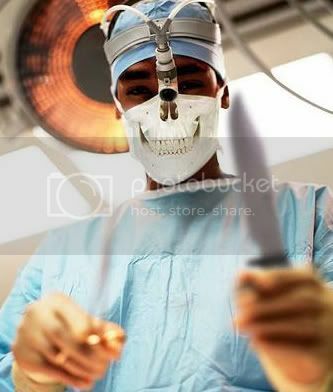 "And so it was that Dr. Death decided to try and rebuild his public image with a smile..."
LOL. Rock on. That's awesome. "Scared out of his mind, thats the last time Johnny took acid before he went under the knife"
Dr. Johnson seriously overestimated the average surgery patient's sense of humor, and was only allowed to implement his ideas for April Fool's Day once. "I'm Twitchy D, I'll be your surgeon today. This is the first time I've done this procedure, but don't worry, I know what I'm doing, I played a doctor on TV." That or "That was the last time Cindy believed her parents about doctors being safe." LOL, awesome on both counts. It's really freaky. I thought about taking it down after posting it and taking a shower and rethinking. It's pretty scary. I shouldn't have posted it. I lose. Dr. House joins the cast of Supernatural. "Don't worry, this won't hurt one bit"
"I'll handle this scalpel as well as I handle a razor, notice how close my shave is today." "The real shocker is I forgot to waswh my hands."